What strikes you most when walking into a new workout space or fitness studio? For me, it is the warmth of a studio and the people inside of it. A fitness journey, to me, is something everybody should feel comfortable embarking upon. The last thing someone should have to encounter is another obstacle to get in the way of working out and we, as trainers and studio owners, have the power to either make the experience a positive or a negative one. Define in Oakley is one of those warm places to me. I have had the opportunity to get to know this studio in a many ways: we hosted a Fit Day class and happy hour there a couple of years ago, I have brought friends in from out of town to check out a great example of our thriving Cincinnati fitness scene, and I have designed private birthday events where Define is a favorite stop. After working with them in all of these different circumstances, I can confidently say a positive experience is always had there. So it was the perfect way to kick off our 7 hour fitness journey through Oakley! 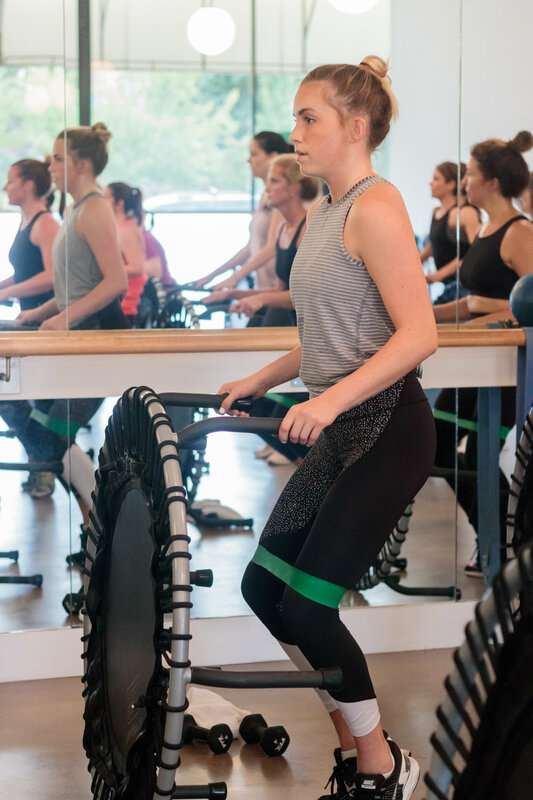 One of our participants, Kate H, told me she was most nervous about trying the Bounce class at Define, simply because she hadn’t tried a trampoline class style before; she walked away saying it was her personal favorite for the day. I gravitated immediately to owners Tallie and Mikel when I first met them and hosted one of my very first events with them. One thing that always impresses me is their ability to make you feel like they’ve known you forever, whether it’s class 1 or 100. They make an effort to know everyone’s name, and give everyone a spirited, rhythmic, supportive class. Their bounce class, in particular, was a light-hearted, buoyant way to start our day. Sidenote: I have also been researching the many benefits of “rebounding” for the body’s lymphatic system, which we should all be taking care of! We rotated through simple, fun jump patterns to upper body, lower body and abdominal work and left with a well-rounded workout under our belt and energized attitudes for our day ahead. Go see what Define can contribute to your fitness routine! On top of offering upbeat Body, Rev, and Bounce classes, they also give back quite a bit! Some special events in the near future include their donation ride for Pancreatic Cancer, and a donation ride for the NICU nurses at Good Sam. Thanks, Tallie and Mikel, for all you do for our Queen City!